The next generation of IP platform is the OfficeServ 7200, providing IP based wired and wireless solution for voice and data communication. Businesses can use OfficeServ 7200 to build sophisticated telephony applications, secure data-communications infrastructure and policy-driven networks. OfficeServ 7200 can simultaneously support both traditional voice communication, voice over IP (VoIP) based data communication, and wireless solutions through Wireless LAN, and offers an effective, affordable solution for any organisation. 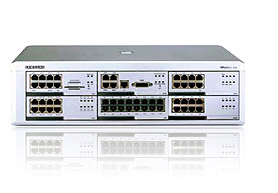 The OfficeServ 7200 makes voice calls and sends/receives data by using the LAN/WAN modules. The user can use the integrated wire/wireless platform (phones, PCs, servers, mobile phones, or peripherals) to communicate easily. The OfficeServ 7200 ensures the Quality of Service (QoS) of the voice calls depending on the priorities and grouping of data and voice packets. - Layer2 QoS: Priority Processing(802.1p), VLAN(802.1q) - Layer3 QoS: Class Based Queuing(CBQ), RTP Priority Queuing, or the on demand management of the bandwidth Wide Area Network(WAN). Samsung OfficeServ supports IP UMS that provides the unified messaging service of telephone, IP Phone, e-mail, voice mail, and FAX. You are able to access to your communication devices through Samsung UMS whenever and wherever you want because Samsung UMS is a web-based sophisticated solution.